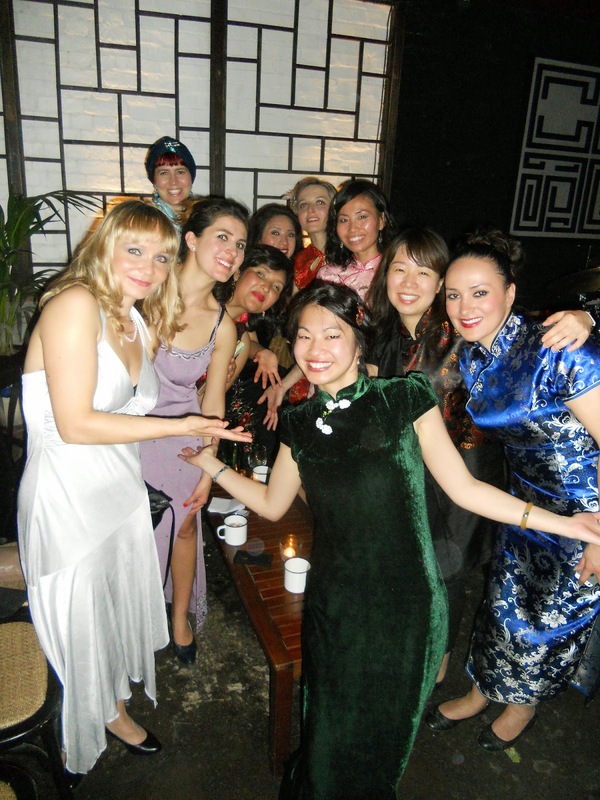 London Hot-Spots/Review: May's Birthday at Cecil's 1930s Shanghai night....the Oolong Tea Experience! 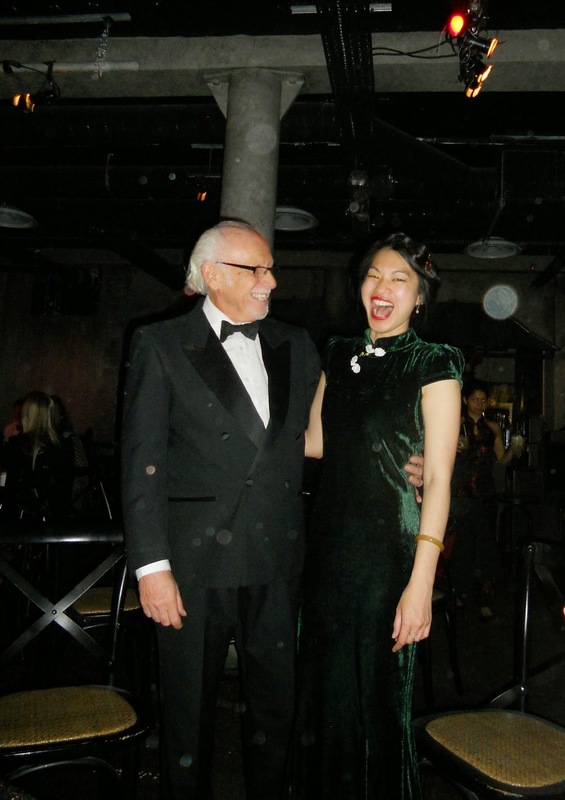 Was I being crowned the silliest 1930s Shanghai girl by Mr Cecil himself? 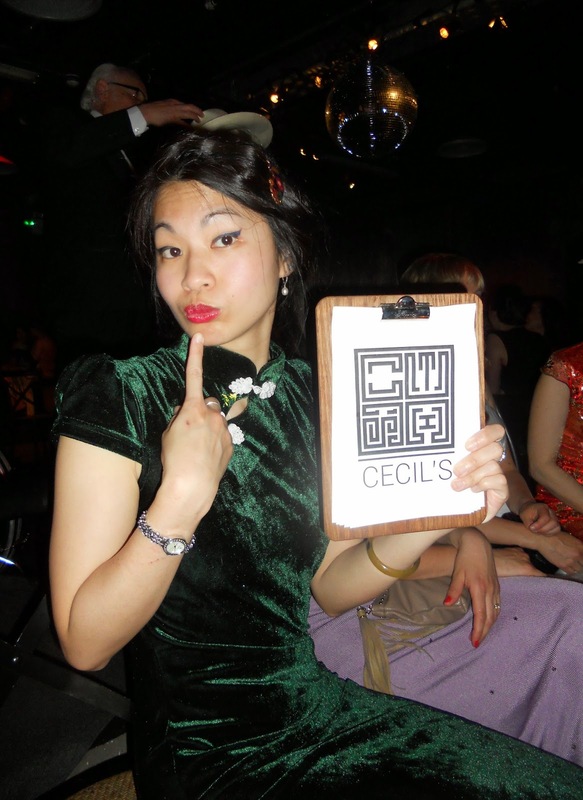 As promised, it is time to reveal my Birthday celebrations at Cecil's 1930s Shanghai night last month....which I accidentally discovered whilst Google-ing something else. 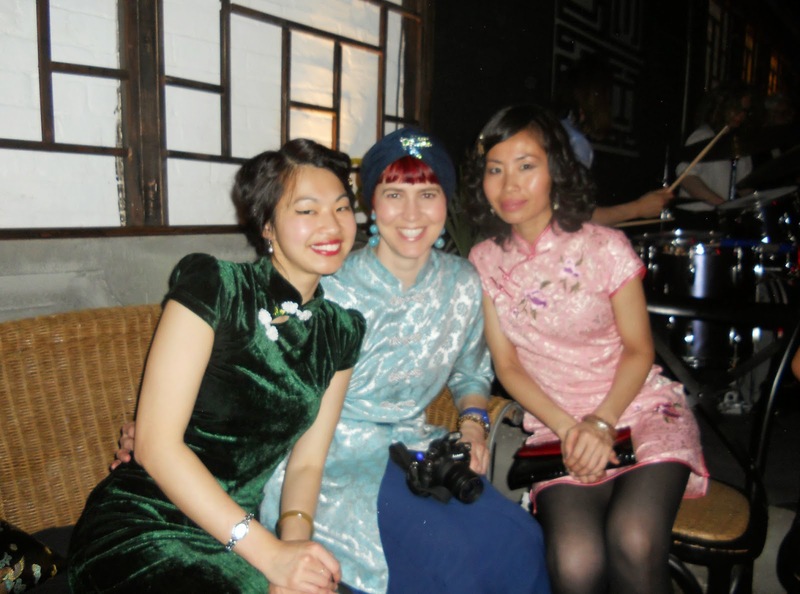 Needless to say, it was the perfect night to don a Qipao (Cheongsam) and get my girlies to wear one too! Preparations started weeks ahead....where I started talking about outfit inspirations, then planned a shopping weekend day to Judy's Vintage Fair as well as Brick Lane to find my girlies something to wear, and finally on the day we got together to dress in my living room as chirpy as birds can be. There was tea, sewing, cake, hairspray and curling tongs, but most of all there was laughter, fun and hugs of happy wishes. Once all dressed, we set off into the unusually warm May weather and took the train to London Bridge in order to walk to the nearby Cecil's which was slightly puzzling to find. Crossing the road as we saw a sign for Cecil's under a bridge, we walked up to a unassuming concrete step to a warehouse looking brick interior. Once we stepped pass the door guardian who matched our telegrams to his name list and into the shadows of Cecil's, we were presented with an enamelled mug of a special Tea Cocktail we did not know the name of. Then Mr Cecil himself appeared from behind a screen with a bellowing welcome and praises for the beauties I had arrived with....1930s Shanghai glamour, we were ready! Silly as it sounds it hadn't crossed my mind that Cecil's really had a Mr Cecil. So when he introduced himself, it took me a few seconds to realise who he was before breaking out in laughter, but he was a gracious and highly entertaining host indeed. 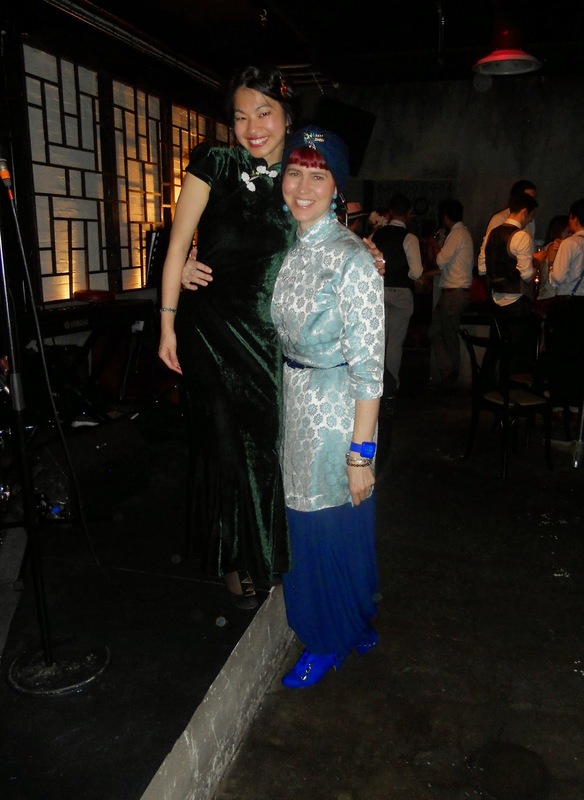 Cecil's was certainly an experience and I absolutely loved that they were running a regular 1930s Shanghai night called the Oolong Tea Experience....what better opportunity for a Qipao lover to be clad in her finery! There is much to be liked....as the paper framed screens, Shanghai girl vintage posters in the ladies washroom, rattan set sofas, tea inspired cocktails, exotic potted palm trees and the Cecil's logo looking like an authentic Chinese seal (used in the old times to stamp one's name on a legal document) set up the inspired Shanghai 1930s theme quite well. 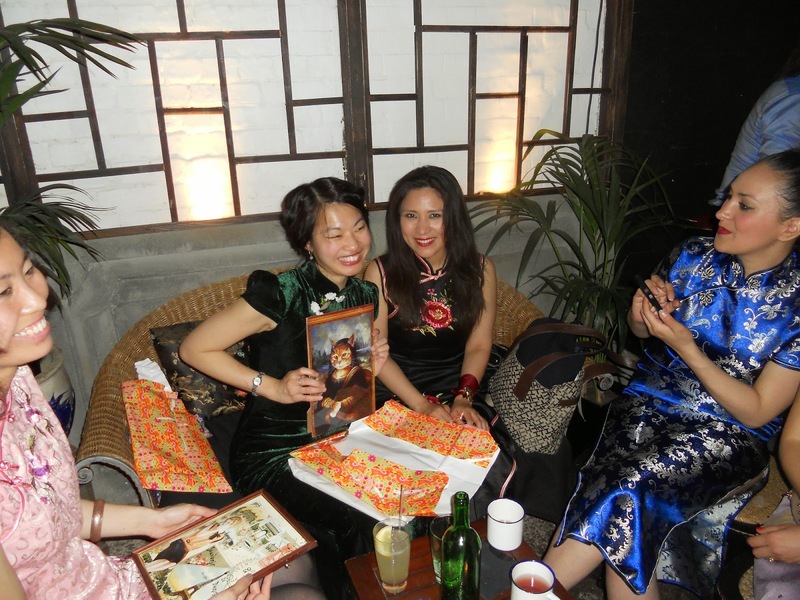 Though I was surprised that not many actually dressed in a Qipao (Cheongsam), and most had either 1920s or modern attire, our party was certainly the main group showcasing the glamorous golden era of Shanghai. At Cecil's they make it their business to know their guests, from whether it is a reservation for a special occasion or making it a point to sing Happy Birthday to the several Birthday girls of the night. And make no mistake, Mr Cecil is more than a simple host....as he was actually the singer of his swing band too. But I did wish Mr Cecil and his band would play some hot Jazz numbers, or that the DJ in the corner could have played some mixes of old Shanghai sounds from the 'Shanghai Lounge Divas' album during the intervals. The limitation of the food menu, actually collected from the nearby Chinese restaurant, and presentation of the food in takeaway boxes did leave us a little disappointed....though the yummy tea inspired cocktails helped to soothe some discontent and we started a train of conga around the dance floor in the middle of one song. It was an unusually warm night in May, so being in the basement whilst Cecil's air conditioning had broken down was challenging to say the least; with me in an ankle length green velvet dress and the girls needing to take breather breaks outside just to fend some less than glamorous sweating off on a special night out. They should really have brought in some temporary fans, air conditioning units or even scattered paper hand-held fans for guests to use, and ensured that each table had at least one or two bottles of water throughout the night, as it really was the only kink in a fun 1930s Shanghai night! 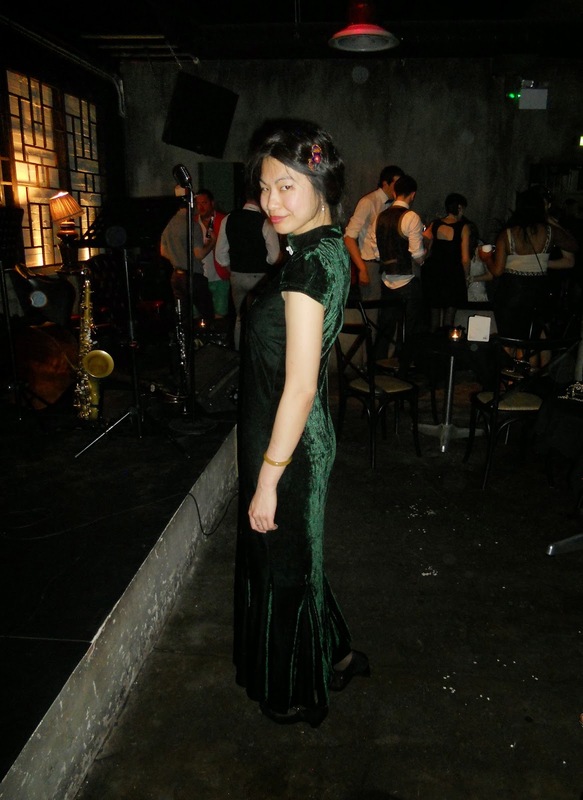 All in all Cecil's 1930s Shanghai night gets a noble 3 ♥ ♥ ♥ out of 5 lovely hearts from me, and definitely recommended for a classy night out, especially when the air conditioning is working and if Jazz is ever involved. Unwrapping presents.....BouBou does vintage too! 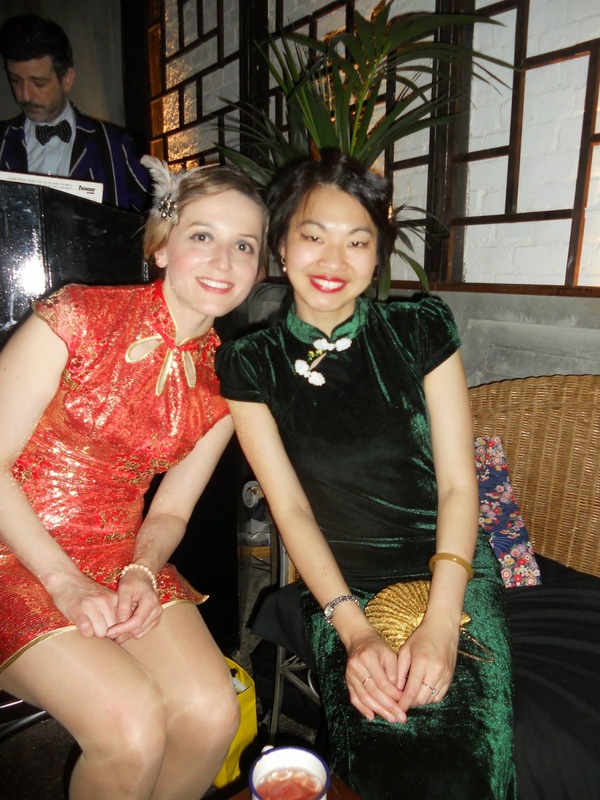 Presenting my very beautiful girlies....in 1930s or Shanghai style! 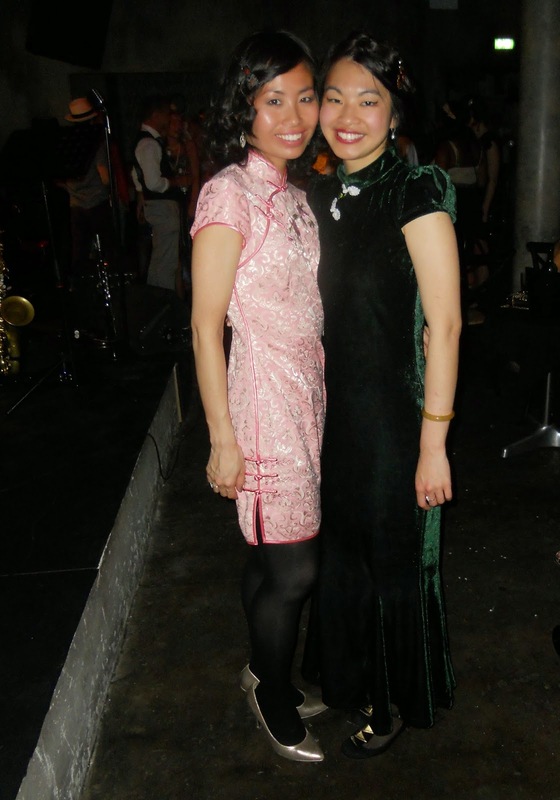 To tell the truth, my Qipao was actually still a work in progress when I wore it that night. Having spotted a green velvet ankle length dress with bias cut and mandarin collar on EBay, I decided I would cut off the button to replace it with some white frogged buttons and started to embroider around the little cut-out near the neck line....being short of time I could not fully embroider the neck line and the mini-cape I started making to match the dress was left unfinished. 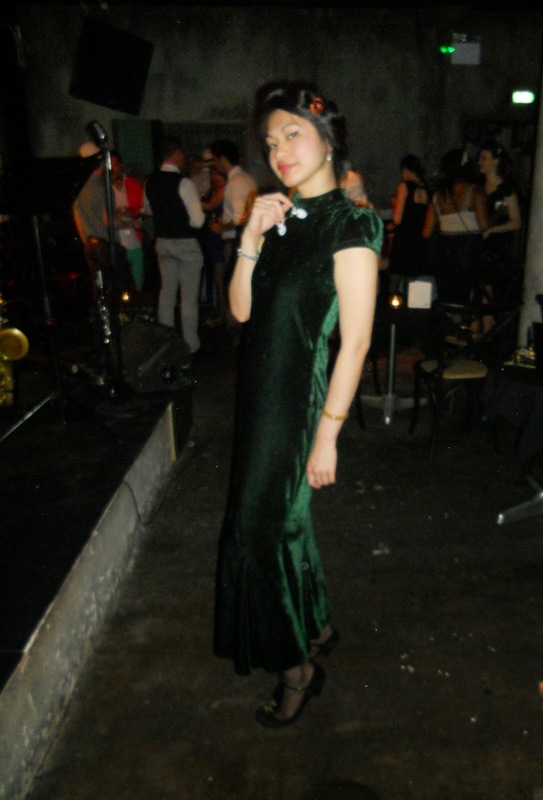 Thankfully with some natural pearl earrings, finger waves, marcasite watch, gold beaded purse and a simple vintage enamelled comb I sneaked into a less than perfect 1930s Shanghai girl look. 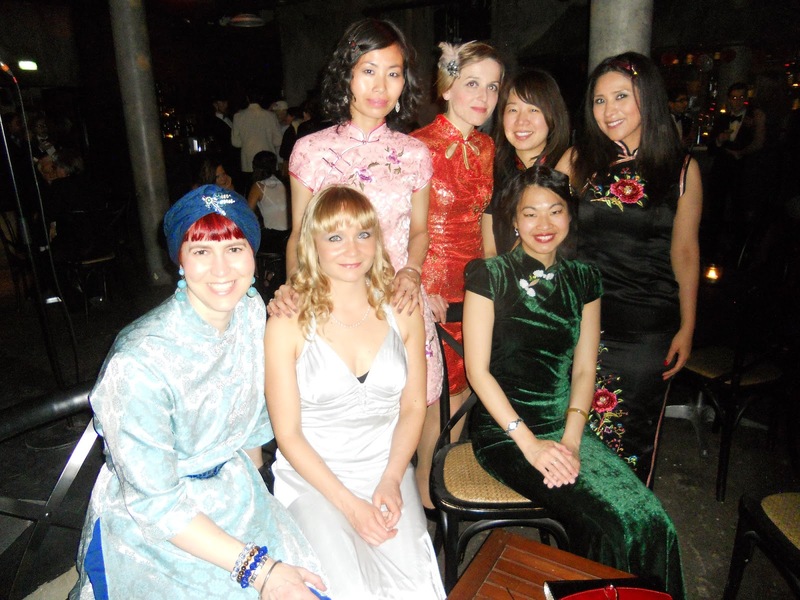 Most of all I was so happy that my beloved girlies all rose up to the occasion to either dress 1930s or in a Qipao....they looked absolutely beautiful and I am sure you will agree. Also, announcing an exciting little project I have recently started...an interactive community to post questions, style ideas and share all things about the Qipao or Cheongsam, so don't forget to join me on the 'Qipao Love' Google+ Community (here). Have a fabulous weekend darlings! Dressing up is always fun but to do so to attend a fabulous event on your birthday is even better! 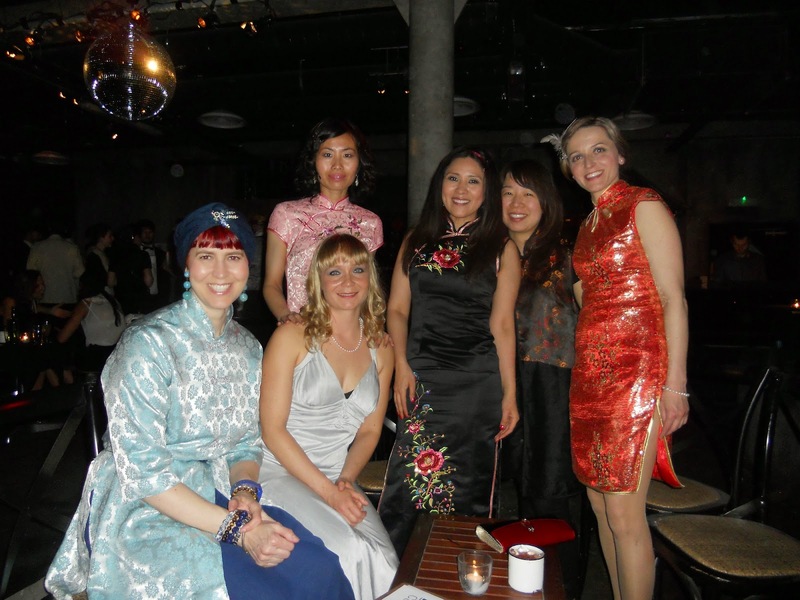 Your dress was beautiful and it looks like you ladies enjoyed a wonderful time. You surel had a wonderful time with your friends! 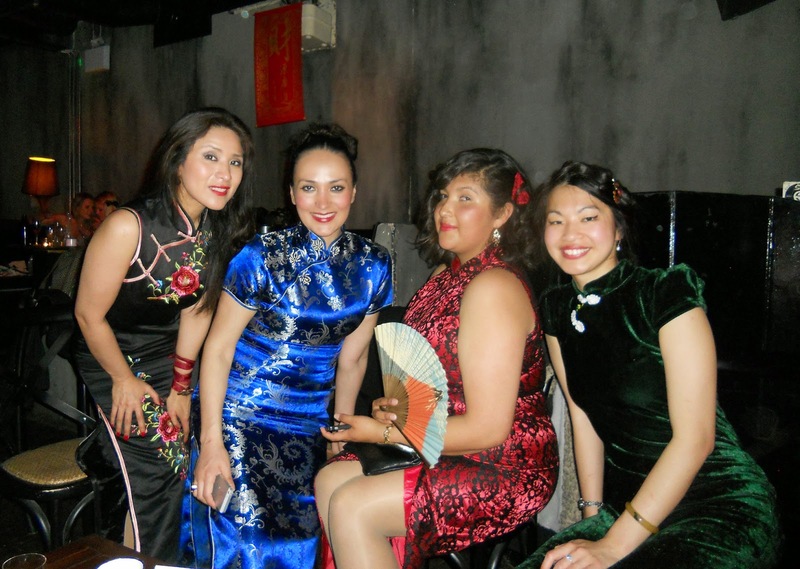 What a wonderful way to spend your birthday celebrations,and how wonderful that all your girlies joined in on the Qipao love, you are all looking stunning (as always) and a green velvet Qipao is perfect on you, you look like a beautiful emerald!